List Price: $9.99 New Price! Master Piece is a full-length album with new material based on the ground-breaking 2010 EP from renowned dub-reggae pioneer, Lee "Scratch" Perry. Produced by Born Free and The Next Room, the album features ten tracks that have impressed critics, employing some of the techniques of the Mad Professor but with a distinctly original, updated sound with elements of lounge-dub and deep trance. "... Perry shows himself to be a true doctor of the soul, whose music is meant to heal and give hope to the spiritually lost.... And by some force, it seems as though Perry is in a constant state of inspiration... 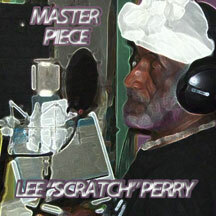 It seems clear that to Perry music and poetry is an expression as well as an affirmation of the divine." Radio, Print, Internet, and Social Media Campaigns will support this release. ... Perry shows himself to be a true doctor of the soul, whose music is meant to heal and give hope to the spiritually lost.... And by some force, it seems as though Perry is in a constant state of inspiration... It seems clear that to Perry music and poetry is an expression as well as an affirmation of the divine.